Dedication of the Victory Shaft in downtown Mount Gilead on Dec. 4, 1919. 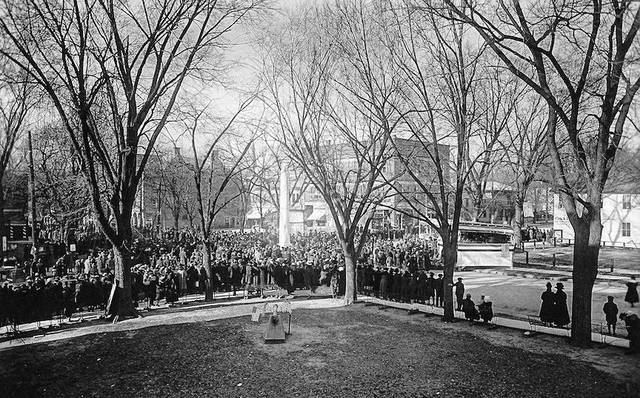 Large crowd at the dedication on the square 100 years ago. MOUNT GILEAD — The Morrow County Victory Shaft Dedication Centennial Committee will present an historical re-enactment of the original dedication of the Victory Shaft Monument which will take place on Saturday, Sept. 28. The celebration will kick off with a parade at 1 p.m., followed with the reenactment at 2:30 p.m. by the Morrow Little Theatre. The monument was originally placed and unveiled on Dec. 4, 1919. 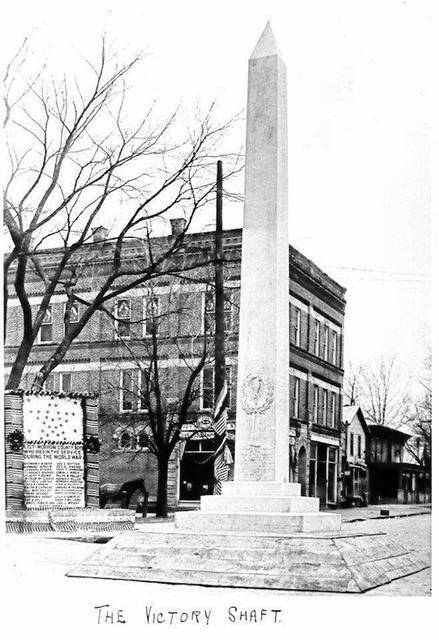 One hundred years after it was installed in the north square of the county seat, the Victory Shaft still stands in Mount Gilead’s square at the intersection of Main and High streets. Morrow County won the monument by outpacing Ohio’s 87 other counties in War Savings Stamp purchases relative to quota during a drive lasting from June 1-Sept. 1, 1919. It had been recognized earlier in the year for having the best per capita record of War Bond and Stamp purchases of any county in the nation. The committee looks forward to commemorating 100 years of Morrow County’s outstanding achievement while inspiring future generations to experience, connect with and take pride in their local history. “The Centennial events are a wonderful way to build awareness of the richness of Morrow County history. Watch for further details about the historic event and schedule of events for Sept. 28, 2019,” a news release states. For information email: VictoryShaft100@gmail.com or call: 419-560-8100.